How did the Earth form and evolve and where do we come from? What are the conditions necessary to form life-sustaining planets? These are among the most profound questions mankind can hope to address and lie at the heart of general interest in science, yet are still far from being answered. 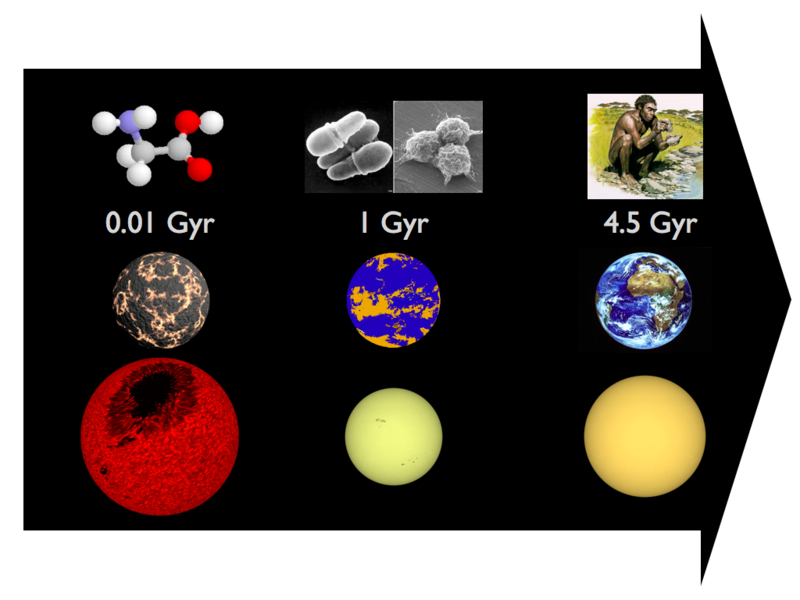 Understanding the origin and evolution of life in the Universe is a multi-disciplinary problem: from the astrophysics describing the processes giving rise to stars and planets and their environments, the geology, geophysics and atmospheric physics of planets, to the chemistry and biology of organic matter and evolution of living organisms. These different aspects are often studied in relative isolation. Life and the Cosmos brings together the relevant expertise within the Smithsonian Institution to study and identify cross-disciplinary research of importance to the origin and evolution of life. Examples of topics of investigation can be found below. During the Earth's history the Sun has undergone great changes that have influenced life on Earth directly and also probably indirectly through moderation of the solar-system radiation environment. One of the goals of Life and the Cosmos is to understand such astrophysical and biological links. Planet Formation: what environments in the Universe are suitable for life? Planet Earth was formed in a few million years within a residual disk of gas surrounding the young Sun. However, clues are now emerging that disks are particularly short-lived in massive star forming regions. Can such regions with short-lived disks form life generating planets? Cosmic rays incessantly bombard Earth, smashing into atoms and molecules high up in the atmosphere, producing cascades of secondary particles that can then reach the surface. There are at least two ways inwhich cosmic rays might have had a profound influence on life on Earth: climatic influence through the seeding of aerosols and cloud cover; and irradiation of the Earth's surface. The biological diversity pattern throughout life history, mainly reflects the continuous interplay between changes in extinction and origination rates, and pulsed intervals of evolutionary innovation and mass extinction. Nevertheless, there is no consensus on the major controls as well as their evolutionary role that have controlled this long-term record. Examination of the possible relationships between the biodiversity dynamics of continental and oceanic primary producers with the cosmic-ray record will allow one to elucidate if these play a significant role as abiotic drivers of evolutionary change, and settle a set of working hypotheses related to the long-term evolutionary mechanisms triggered by that component. The ways in which variations in solar radiation impact the Earth's atmosphere and climate are still far from being understood.